The Orbea Orca Aero brings performance with an aero construction that openly defies the wind with panache. It brings performance and an incredible appearance that is sure to turn heads while you zip by everyone else in the peloton. Find that extra ounce of strength within a machine purpose built for glory and seize your opportunity to land yourself on the top step of the podium. The Orbea Orca Aero effortlessly achieves marginal gains, providing you with the performance and aero advantages so many seek. It offers an improved torsional strength due to the optimization of the headtube, bottom bracket and chain-stay joints. This creates a more rigid structure for improved power transmission. The fork has also seen some major improvements, which now see a wider fork opening for reduced airflow pressure achieving a 4 watt drag reduction. Don’t worry though, it’s still UCI legal. The shortened tail enables the use of a flatter tubing, softening the airflow towards the bottles. The Orbea Orca Aero M20 comes decked out with a complete Shimano Ultegra R8000 drivetrain, providing you with smooth and reliable shifting performance you can count on. Attack and outsprint the competition on Vision Team 35 Comp Wheels wrapped in Vittoria Rubino tires. The Orbea Aero OMR seat post reduces air turbulence due to its aero profile and still manages to maintain great vibration absorption capabilities. The Orbea Orca Aero comes ready out of the box to win, question is.. are you? Shortened Tail: Enables the use of a flatter tubing, which softens the airflow towards the bottle cages. Double Radius: Opens up airflow around the tubing profile, with improved airflow over the different angles. Flattened sides: Reduces friction at the front of the tubing and provides better drag at low speeds. New freeflow fork: UCI legal aero fork with a wider/more aerodynamic structure. Orca Aero Seat Post: Reduces turbulence and provides aerodynamics. Rigid Structure:The headtube, bottom bracket and chainstay joints are optimixed for improved torsional strength. 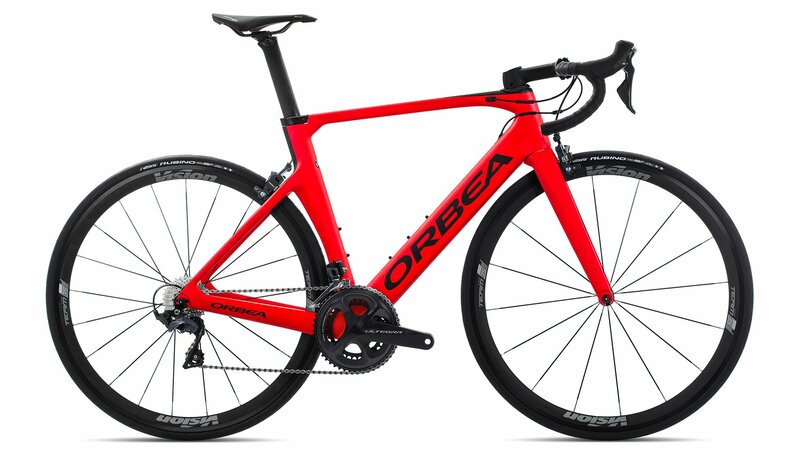 Orbea Orca Aero carbon OMR, monocoque construction,tapered 1-1/8" - 1,5", BB 386mm, powermeter compatible, internal cable routing, EC/DC compatible.